King of the Rocks is another fast thinking strategy game similar to games like Civilizations Wars, Bug War, Nano War or Phage Wars. The object is to destroy all the enemies units in all levels. You will soon discover that acting fast is the key to easily beat most levels. Mills and Towers must be conquered as soon as possible, as they provide resources for upgrades and balloons that can be quickly sent toward enemy towers. 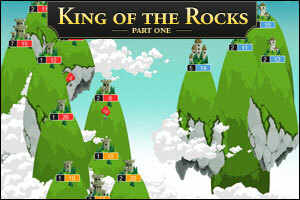 Nicely done, King of the Rocks is an enjoyable game that all fans of the genre will like. I’m stuck at the level with 8 tower of power 5 and one of power 1 juste in the middle. beginning in this tower with two ennemies. I’m blocked in the next level of the one described in the previous comment !!! How can I beat this ….ing level 10 castle ? repeatedly hit the space bar while clicking on the three rocks. Try to always click on the rocks owned by red. If you fail the first time, restart. Took three attempts. repeatedly tap pause while clicking!!! the stage with the 10-level castle is the last stage. capture the closest 2 towers quickly. after that keep sending everything you’ve got at the 10-level castle as quickly as possible. with any luck, all your ballons will bump into each other, and capture the castle. once you have it, retake everything esle. one point i didn’t like: the mills and upgrades are pretty useless for most of the later levels. you do not retain any of them long enough to provide any benefit. Capture the two closest towers down below. Then send new balloons from your leftmost castle one at a time to the 10-level castle (as soon as you get a balloon, send it). This is just to hold off the onslaught. Meanwhile, move balloons from the bottom castle to the top castle. The moment the left castle gets taken over do the spacebar thing and just attack like crazy against the 10-level castle. There is a factor of luck involved. The key is retaining both the mill and the castle and keeping your big balloon alive (should be roughly 16 to 18 balloons at first and will dwindle to around 5). If you lose either the mill or the castle before acquiring the 10-level castle, you have to restart. If you lose the big balloon, you will have to restart as well. Ignore the stuff in the middle. The key is to take over the 5-level castle right away. The computer almost never has enough balloons inside the castle to defend it. After that, take over a few mills and then win. I kept trying to take over the mills next to my castle. Spacebar. Selects all your castles at once. You can quickly beat most of the levels with this strategy. The larger the balloon, the slower it will travel. Use this to your advantage. You can send ‘1’ balloons out after ’12’ or higher balloons and they will catch up and combine to form an even bigger, slightly slower balloon. Thanks Megan, for the tip with the very last level (10). It was driving me crazy!! Thanks again! send half of the turret to another one. last level i did at my own way. Posted on Wednesday, April 21st, 2010. Follow any responses through the RSS 2.0 feed.